UC Health Centre is closing at Thursday 21 December, 12 noon and reopening on Monday 22 January 2018. The Centre is closed longer than usual for the summer holiday period to accommodate internal building work. Patients can receive health advice whilst the Health Centre is closed by phoning +64 369 4444 (including international students registered with UC Health) and will be transferred to a Registered Nurse for health advice. Domestic patients that are enrolled at any medical centre in the Canterbury District Health Board area can access free under 21 years of age consultations for contraception, including emergency contraception, from Riccarton Clinic or Moorhouse Medical. Note: you must request ‘under 21 consultation’ if applicable. As we prepare for the holiday season, we expect this to be a time of family togetherness, happiness and goodwill. Although it is meant to be a joyful time, it can also be one of the most stressful times of the year. The season will not linger too long either so enjoy every minute when you are surrounded by loved ones and family members and be thankful that you have a wonderful season to celebrate. Here are some tips to help you (and your teams) thrive not just survive the holiday season and focus on the positive. Check out for info on all these tips and other messages in the EAP newsletter. Wishing everyone at University of Canterbury, and their families and loved ones, a safe and happy holiday season. Can we all please make safety a priority this holiday season, whether that be at home, on the water or on the road … please take the extra time to follow the information on these useful links to ensure a happy holiday season is had by all. Forestry Road will be closed between Arts Road and the Biology car park from 6am Saturday 16 December to 6pm Sunday 17 December. This closure is to allow for façade panels to be lifted into place on the eastern end of the Rehua building. Access to the Clyde and Psychology car parks will be via Clyde and Arts roads. Please follow traffic management signage and instructions, and take care when travelling in the area. 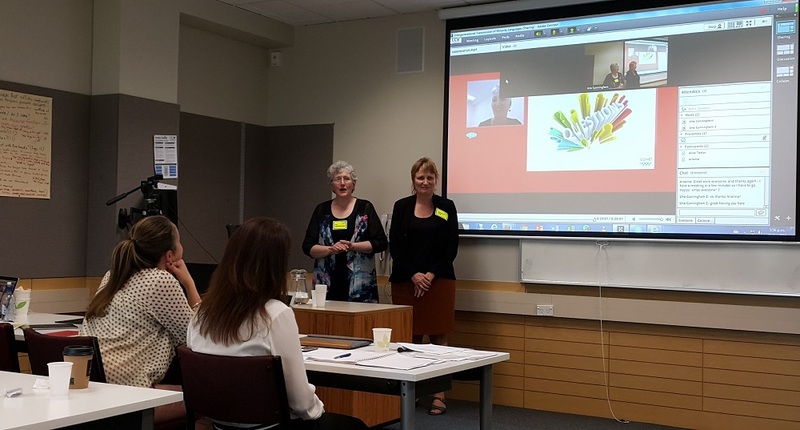 Una Cunningham of Teacher Education and Jeanette King of Aotahi convened the Third UC Intergenerational Transmission of Minority Languages Symposium: Challenges and Benefits, which opened on 11 December 2017. The symposium was entirely online and asynchronous. Presenters send in pre-recorded video presentations which are uploaded to YouTube and Figshare (so each presentation gets a doi number). The understanding is that uploading implies consent to having the material available under a Creative Commons attribution licence (CC BY 4.0). Then each presentation has a page on our Learning & Teaching Languages Research Lab WordPress site with the name and affiliation of the author(s), the abstract they submitted previously, an embedded link to the YouTube version of the video file, and information about how to cite the presentation including a mention of the symposium and the doi number which links back to the Figshare version of the file (generally in the less compressed version supplied by the author), which in turn also links to the symposium WordPress page. The comment function is enabled, but moderated. The format attracted presenters from the United States of America, the United Kingdom, Italy, Taiwan, Argentina, Belgium, the Netherlands, India, Qatar and Brazil as well as Australia and New Zealand. Presenters had the opportunity to share their work indefinitely, with a very wide audience, and to receive comments and enter into discussion with others, inside and outside academia, without any kind of paywall. We haven’t heard of this being done elsewhere, but we would love to hear about it if someone at UC is doing this too or knows of anything similar. Please take a look at some of these presentations and let us know what you think! From 9am till approximately 12noon, on Saturday 9 December, printing services and Canterbury Card top-up services will be unavailable whilst ITS updates the printing system. We apologise for any inconvenience this outage may cause.